In Nigeria, a new wave of attacks has seen dozens killed in Christian communities across the country. The violence has hit the north-eastern state of Adamawa, one of the most affected by Boko Haram, and also the Middle Belt states of Nasarawa and Benue, where Fulani herdsmen have caused havoc in recent years. In Adamawa state, a Christian student was killed, and others injured, in an attack by Muslim students at the Modibbo Adama University of Technology (MAUTECH) of Yola, the state capital, on 4 February. A local source, who wanted to remain anonymous, told World Watch Monitor that the incident started around 7pm, as some students were in their classes, revising ahead of their exams scheduled the following day. Other students were holding their fellowships in various places across the campus, when suddenly, a mob of fellow students, armed with sticks and machetes and chanting “Allahu Akbar” (Allah is the greatest), stormed the classrooms. 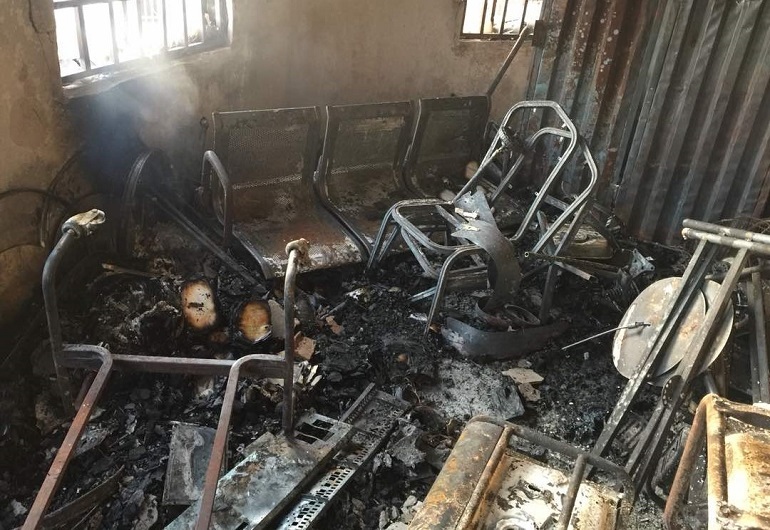 Christian students in one of the lecture theatres (Lecture Room LT2) were forced to flee after their room was set ablaze. They ran immediately to a Catholic church (still on the campus), where other students were having their fellowship, to prevent the assailants from attacking and setting it on fire. Other students who were having their fellowship in another church, the Trinity Chapel (also on the campus), had to come out immediately to help. 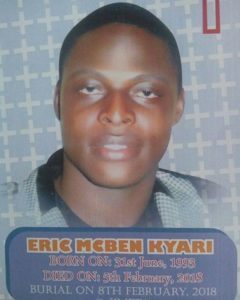 Erick McBen Kyari, 25, a second-year Urban and Regional Planning student, was attacked, along with three other students. They were helping to evacuate other injured fellow students when he was hit on the head with machetes and sticks. He later succumbed to his wounds. His funeral was held yesterday (8 February) at ECWA Bishara 1 Church, in Yola. The assailants also destroyed nine out of 11 stores where Christian students keep their musical instruments, setting them ablaze. The Muslim students said they were angered by a message posted by a Christian student on Facebook on 18 December 2017. They said the message was an insult to their prophet, Muhammad. In a message posted on Facebook, they warned the management that it had 24 hours to respond or they “will do whatever they feel it’s right for them and nobody will stop”. The Christian student accused of posting the blasphemous message denied any wrongdoing. 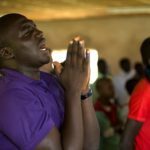 Ajine Delo, President of the Youth Fellowship of the Christian Association of Nigeria (CAN) for Adamawa state, told World Watch Monitor that the accusation of blasphemy was only an excuse to attack Christian students. “At the time of the attack, there was no single Muslim female student at the campus,” he said. “They have all left since Friday, but nobody informed the Christian students. The university management condemned the violence and announced the closure of the university. 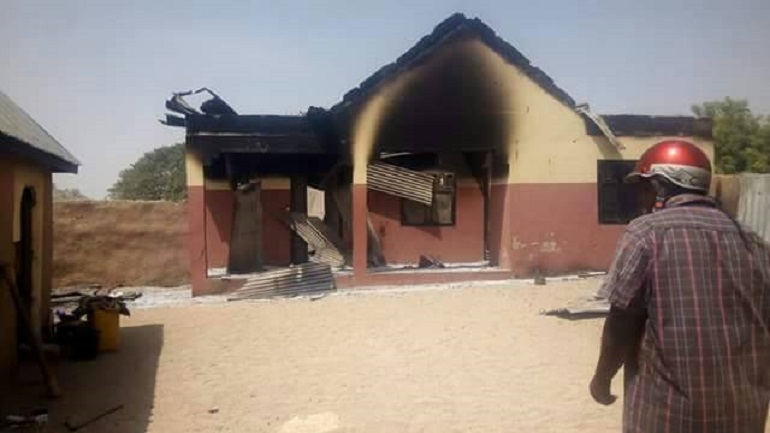 Meanwhile, at least 30 people were killed in two separate attacks by armed men, believed to be Fulani herdsmen, against Christian communities in Song LGA, also in Adamawa state. On Friday 2 February, the assailants attacked and burnt down Shimba and Shiure villages. Two days later (4 February), they attacked and burnt down Tinde and Dumne villages. The second attack took place in broad daylight, as people were about to go to church, a local source told World Watch Monitor. He said the assailants chased and killed many innocent people. They also burned down lots of properties, including nine churches. In the central state of Nasarawa, some 25 villages have been destroyed since 15 January, as Nigeria’s Daily Post reported. The inhabitants of the affected villages are predominantly Christian farmers from the Tiv ethnic group. An umbrella group, ‘Concerned Indigenous Tiv People’, has accused the authorities of not doing enough to protect their communities. Two people were killed, and many others sustained serious injuries, in a fresh attack attributed to Fulani herdsmen in Waku village, Guma Local Government area, on 6 February. According to local media, several houses were set ablaze in the village. Benue state has been among the worst affected by Fulani herdsmen attacks in recent months. On 11 January, 73 people were buried during state-organised mass funerals following violence over the New Year in Makurdi, Benue’s capital. The ongoing violence has prompted the state’s governor, Samuel Ortom, on Tuesday 6 February to call on the people of the state to defend themselves from herdsmen attacks. On Wednesday (7 February) the Nigerian Army said it would send troops into the restive Middle Belt region. According to an Army spokesman, Major General David Ahmadu, the deployment will start from 15 February, and will crack down on “herdsmen/farmers clashes and attacks on innocent members of our communities, particularly in Benue, Taraba and Nasarawa state, by armed militias”.